The message in the media was clear about the December 12 demonstration. 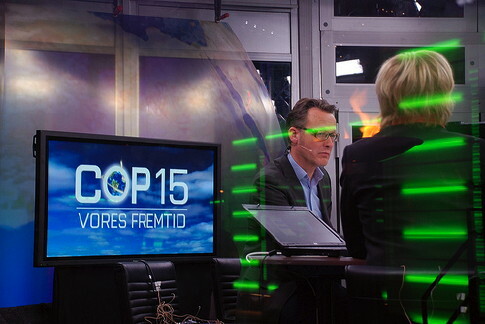 In TV2, one of the main stream channels, the news of the activities outside COP15 that they were divided in three almöst equal parts. First came a report about how people in the demonstration had been throwing stones at windows and how a policemen had been hurt. Then one could see mass arrested people sitting on the street while the head of the police sated that it had been necessary to intervene to protect the demonstration so that the peaceful demonstrators in dignity could continue. The second part had a Danish top model and speaker at the demonstration to tell the viewers of the message from the many demonstrators. She said that what happened at Bella Center was like in a family, there were quarrels at times but in the end things would be solved. In between her statements the viewer could see her catwalking in fashion clothes. 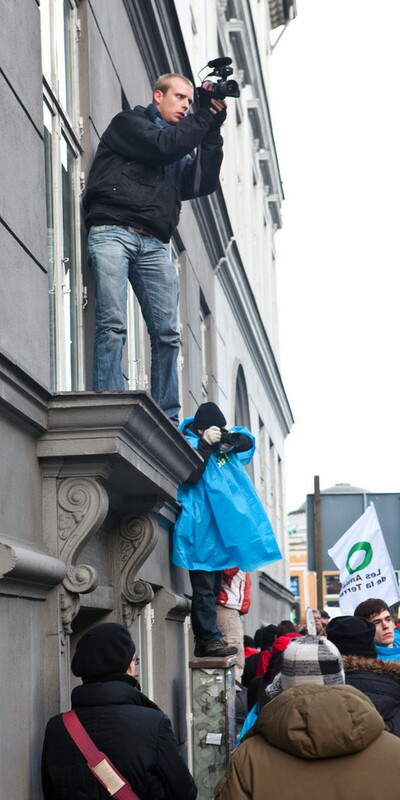 A member of the Danish construction workers union acting as demonstration steward said something negative about violent activists and a young person was presenting criticism against the treatment of those arrested. Finally Vestas wind mill stand at the Forum climate fair was presented in length. It was this fair that Never trust a COP had the idea to protest against instead of walking with the main demonstration. Now the director of Vestas could blow air together with children and the Danish crown prince making a model of a new Vestas wind mill spinning. Ekstrabladet presented the story that a policeman had been hit by a stone and that the black bloc and some foreígners were arrested on Amagerbrogade after some firecrackers had been shot according to the police on the bridge between Christianshavn and Amager. On a news video by the same daily one could see a lot of people dressed in different clothes neing among the first arrested. Headlines on the website stated that Beautiful Helena were holding a speech with pictures of the top model walking among the demonstrators in a tcktcktck message on her breast. Another title on December 12 stated that a violent circus was ready for making riots. In general the Danish press gives a bit better picture. But also Politiken, a liberal daily considered to be serious with an editor that later condemned the use of arbitrary mass arrests at Amagerbrogade gives the top model Helena Christensen and the other celebrity speakers the main stage. ” – I think it is reasonable to assume that we all hope for a fair and binding agreement in Copenhagen, said the Danish beauty” writes Politiken and continuous presenting a message from the front with ”peaceful demonstrators” with the head line ” Demo vanguard: Too bad with riots”. An article from Ritzau, the Danish news agency, once more presented the false information that a policeman had been hit by a stone at the demonstration when in fact it had happened far away from the demonstration and after the mass arrests had taken place. The article listed all the countries the arrested people had come from. In a hour by hour report from Politiken if one was willing to follow the details the truth about were and when the policemen was hit was stated. In general main stream press also told the story about how the police had forced or guided Never trust a COP into the main demonstration, but often as in the case of the biggest Danish daily, the right wing Jyllandsposten, only in the web edition. ”During the event, I was working in downtown Copenhagen alongside TckTckTck, 350.org, and Avaaz staff, collecting photos and videos coming in from actions all over the world. Behind me, a huge 2 by 5 foot screen showed local TV coverage of the march. I was inside a media hub, surrounded by information, and the positive messages that kept flooding in. But until I heard verbal accounts from marchers and observers, and saw the footage that Ekta Kothari, Project Survival Media videographer, had shot during the day, I assumed that this particular action, the march in Copenhagen, had been pretty scary. Most of it wasn’t.